Learning to swim is a life saving skill. Why isn’t my child improving like John (for example)? Everyone’s different and should never be compared to others; strength and motor skills develop at different times (early/late bloomers). Do you offer make up lessons if my child’s missed a session through clash of activities or sickness? We are unable to provide catch-up lessons for swimmers who choose to do other activities at their lesson time. In the case of serious illness if 3 consecutive lessons are missed we will credit lessons into a following enrolment; a medical certificate will be required. I have children of differing ages and abilities. Can they both get a lesson at the same time? Several different class levels are run simultaneously; it would be dependent on whether your children slot into these or space is available at the time. What feedback will I be given on my child’s progress? We have allowed a 5 minute changeover between classes to gather feedback from the child and parent. Children will receive a certificate at the end of each term indicating what level of proficiency and skills they have attained. How do I know what class level to book my child into? A free assessment is offered (unless your child is a pre-schooler) when you first book to determine what class level is most suited to them. Your child will be constantly assessed during the course of their lessons to ensure constant progression through the levels. How often should my child attend a swimming lesson? More is better for swimming; children need to retain a ‘feel’ of the water and will learn faster the more they’re in it. Do I need to remain poolside for my child’s lesson? Children may not be left at the pool on their own. They must be supervised by a parent/caregiver over 16 years at all times. Parents are required to be in the water with their children up until our Patrick Star Advanced level; optional for our Krabby Patty level. 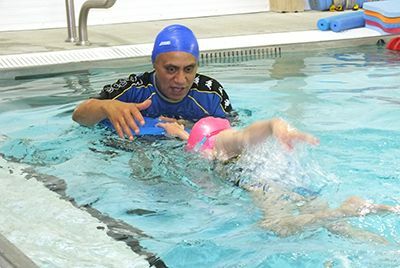 Waitaha Swim Club is based at our facility and offers competitive swimming at all levels including open national level. We offer a 10% discount for families with 3 or more children enrolled in weekly lessons. Clients will be automatically re-booked on the same day and same time until their progress requires them to move to another class. You must provide a month’s notice if you no longer require our services or wish to take a break. You can be placed on a wait list for your return. You may pay by direct credit into our account. We also have cash, eftpos, and credit card facilities at the facility; please note any payments made via credit card will incur a 3% surcharge. Fees must be a minimum of one month in advance, further payments to monthly. Condition your child to the water, make them feel comfortable and relaxed in the pool environment through play. For infants 3 and under only. Waitaha Swim Club caters for emergent competitive swimmers through to nationally competitive squads. Receive top quality coaching, train with a great group of swimmers, improve your aerobic base and technique.